LICENTIA is a suite of web services to help in the process of choosing the most suitable license depending on the data to be licensed. This website does not provide legal advice. The information provided by LICENTIA are automatically generated. LICENTIA is an online service created and maintained by the Wimmics Research Team: a joint research team between Inria Sophia Antipolis - Méditerranée and I3S (CNRS and Université Nice Sophia Antipolis). The core technology used in LICENTIA services is powered by the SPINdle Reasoner and the use of Defeasible Deontic Logic to reason over the licenses and conditions. The dataset of RDF licenses used in LICENTIA is the RDF licenses dataset where the Creative Commons Vocabulary and Open Digital Rights Language (ODRL) Ontology are used to express the licenses. Specify what are your constraints. Mark what permissions, obligations and prohibitions you would like to associate to the use and reuse of the data. State rights and limitations. LICENTIA will return you the list of licenses compatible with the selected conditions. In case you do not find any compatible license satisfying the data producer conditions, the search engine will return the set of the closest licenses compatible with the selected conditions, highlighting the unmet ones. For instance, you want to allow the person to distribute the data. You want to oblige the person to attribute the data and you want to prohibit the commercialization of the data. You can now check among all the licenses what are the ones which are compatible. In GREEN - all these licenses are compatible with the need you have. In ORANGE - there might be some adaptation, they are not exactly compatible. If a license was to appear in RED, it means it would be entirely incompatible with your needs, it would be in contradiction. When you choose a license, you can go inside and check (through a set of conditions) the permissions and obligations of that license in details. Check if the license you want to use for your data allows for a certain use or reuse of the data. 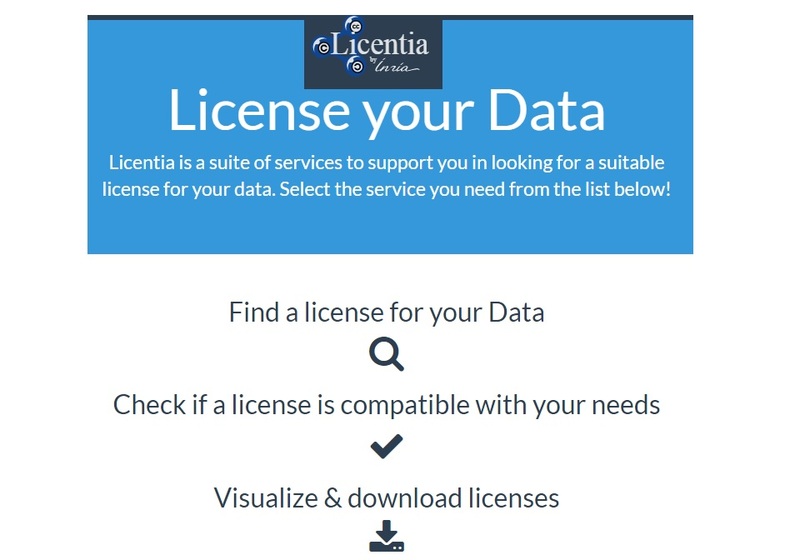 LICENTIA will tell you whether the license is compatible with the selected conditions. If the license is not compatible, the service will return the list of the conditions conflicting with the licenses available in the licenses dataset. Once you find the license your are looking for, you will be able to download it in RDF (Turtle syntax) to attach it to your data, to publish it on your website and re-use it in your data. Moreover, you can visualize a graph- based representation of the license using a licenses visualizer. “...and remember... applications pass but data remain” , - Fabien Gandon (INRIA), MOOC: Introduction to a Web of Linked Data. CC0 expresses a clear pro-open research position on the part of the University and its researchers. # Why does Dryad use Creative Commons Zero? (CC0 is mandated for all data submitted to the Dryad digital repository). # Open by default: a proposed copyright license and waiver agreement for open access research and data in peer-reviewed journals (BMC Research Notes). ODC Attribution Sharealike asks that changes and updates to the dataset are made public too, that credit is given, that the source of the data is linked, that open formats are used, and that no DRM is applied. ODC references an RDF term (waiver:norms) that allows you to be explicit about the community norms to which you encourage users of your dataset to adhere.